Zuckerberg faced a tough reception from the House Energy and Commerce Committee on Wednesday morning. Mark Zuckerberg said he was a victim of the Facebook data-harvesting scandal, too. On his second day testifying before Congress, the Facebook CEO said he was among the 87 million people who had their data harvested through a quiz app. Zuckerberg faced a tough reception at the House Energy and Commerce Committee on Wednesday morning, less than 24 hours after being grilled by Senators about election meddling and how Facebook handles user privacy. At times, the hearing Wednesday was more heated than the five hours Zuckerberg spent in the hot seat on Tuesday, where he took questions from the Senate Judiciary and Commerce Committees. Lawmakers came armed with questions about the nuances of Facebook’s privacy settings and whether the company is properly supplying its users with the knowledge and tools they need to protect themselves. 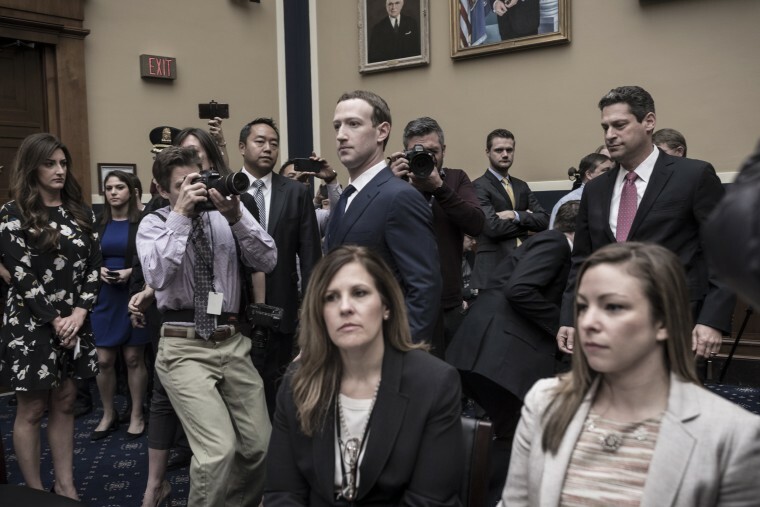 Rep. Frank Pallone, D-N.J., asked the Facebook founder whether he was willing to change Facebook’s default settings to minimize the amount of data the company collects from users. “This is a complex issue that deserves more than a one-word answer,” Zuckerberg said. “That’s disappointing to me,” Pallone said. While all eyes were on Zuckerberg, two other stars of the hearing weren't even in the room. Diamond and Silk, two sisters known for their lively online videos supporting President Donald Trump, were brought up several times throughout the hearing. The duo's videos were recently reclassified as being "unsafe" for the Facebook community, something their supporters said amounts to censorship. Rep. Billy Long, R-Mo., brought out a poster of the sisters and read a question he said they had sent him to ask Zuckerberg. Rep. Marsha Blackburn, R-Tenn., told Zuckerberg: "Let me tell you something right now — Diamond and Silk is not terrorism." Zuckerberg said Facebook had made a mistake in limiting the reach of the videos. In his opening statement, Zuckerman echoed sentiments he expressed on Tuesday and has been stressing on his apology tour. “It was my mistake and I’m sorry,” he said, before launching into his talking points about how Facebook needs to take a “broader view” of its responsibility and how he plans to do better. On Tuesday, Zuckerberg told senators that Facebook had notified the Trump and Clinton presidential campaigns of attempts by Russian government hackers to compromise their accounts. Robby Mook, who was Hillary Clinton’s campaign manager, tweeted that the Clinton campaign was never notified of these attempts by Facebook. In a rare moment of bipartisanship, Brad Parscale, who worked as Trump’s digital director in 2016 and is serving as his campaign manager for his 2020 re-election effort, sided with Mook.